As far as Skiathos nightlife goes, you need not wander too far to find a range of top-notch entertainment establishments on this Island. In the capital of Skiathos Town itself, you will be at liberty to choose your nightly path between the two main bar concentration poles- that is, in case you prefer to stay away from the busy clubs. By opting for one of the bars in the settlement to the southwest, you could relax to the sounds of soothing lounge music while sipping shots of traditional Greek spirit, ouzo. For the eastern side of the settlement, located by the harbour front, it similarly features plenty of opportunity for Bar-hopping, as opposed to settling on one place only. With a string of bars that are filled with young people having fun, drinking and dancing inside and outside, it’s easy to fit in with the locals as long as the Greek spirit is present. Bars generally stay open until late at night, and you can be sure that as long customers are buying drinks and people are having fun, bars and clubs are likely to close in the wee hours of the morning. 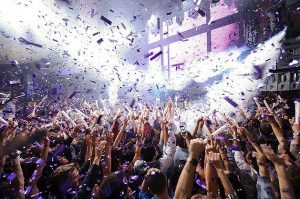 The second concentration pole, or known as the infamous other area to enjoy the nightlife of Skiathos, is indeed more famous for offering some of the finest clubs on the Island. Located in the old town, revolved by Trion Hierarchon square, Papadiamantis street and the west end of the harbour- this area features a range of different clubs that are suited to all tastes. 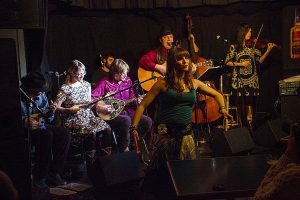 Here, you can make your pick from mainstream clubs or more sophisticated clubs prone to playing jazz and classic rock. Finally, one of the newest social districts of the island is found by the old port, where you can enjoy even more clubs to the likes of ambient chill-out music while sipping an exotic cocktail. Some things to keep in mind when opting for either bars or clubs in Skiathos, have to do with alcohol consumption and the most value you can get for you money. For one thing, you won’t find pints in Greece, however beer is always available in either 330ml or 500ml cans. Beer is a solid budget option as being cheaper than in UK and most other places. While you’re at it, you will potentially be delighted with the taste of local beers such as Mythos and Alpha. Alternatively, you also get to enjoy international brands such as Amstel, bottled in Greece. Having said this, beyond and in comparison to beer- wine would actually get you the best value for money by providing good quality at reasonable prices all the same. When it comes to other spirits, you best be aware of extraordinary prices to the likes of paying 7€ for a vodka. 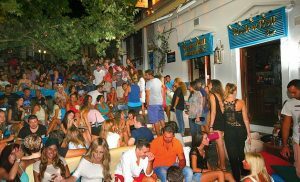 Now, notwithstanding the abundance of clubs and bars that are open to accommodating your cravings, you may feel that Skiathos nightlife would be redundant without the incorporation of at least some traditional Greek music. Well, if you’re looking for a “bouzouki” night, it could indeed prove to be a most fascinating and culturally enriching experience while in Skiathos. Needless to say that although the lyrics are literally Greek to you, you would nonetheless be swept away by the fabulous atmosphere and what is called kefi, meaning high spirits. Few options are available as far as enjoying authentic Greek music until morning, making for a more special an intimate experience. 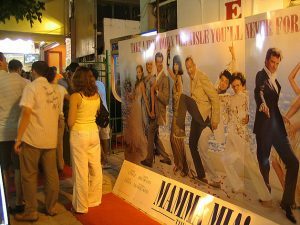 Another of Skiathos’s nightlife attractions must undoubtedly encapsulate the concept of typical Greek open air cinemas, which are very are popular in Greece indeed. Generally, the weather favours these famous open-air entertainment establishments, enabling the delight of many a movie watcher under clear and starry skies. Most movies are shown in English with Greek subtitles, so won’t have trouble picking a movie to watch. Of course, if you feel like scrubbing up on your Greek skills, feel free to watch a Greek movie with English subtitles, and potentially also gain more insight into the historically rich and vivid arena which is the Greek culture. 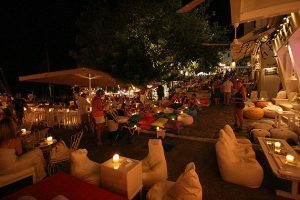 All in all, one thing is certain as far as nightlife Skiathos is concerned: Never a dull moment!